Termites aren’t just a problem for the home. 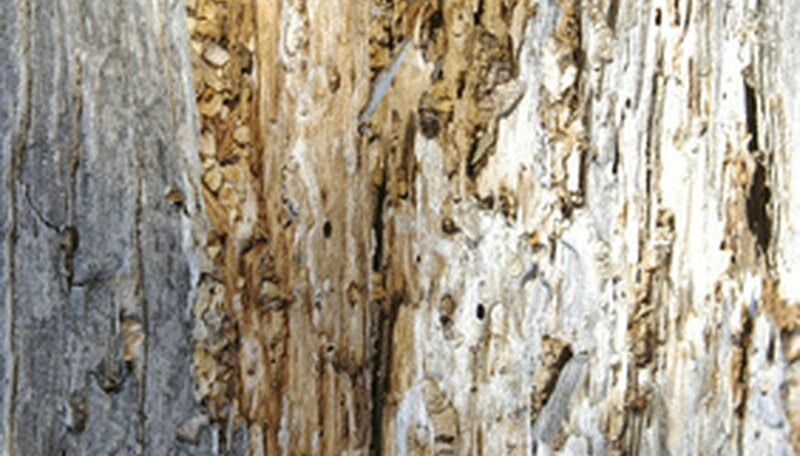 In older or weakened trees, termites can slip under the bark and begin to eat the trunk of the tree from the inside. Although termites prefer hardwood trees, they will also colonize and feed on softwoods, such as southern pine. Once a colony moves into a tree, the termites can nest there and slowly kill the tree from the inside out. The best way to stop termite damage to a pine tree is to kill the termite colony. Use a magnifying glass to examine the trunk of the tree for exposed, hollowed-out areas where a termite colony has been eating wood. These exposed areas are known as galleys. Many termites like to eat the wood directly under the bark of a tree. You may find galleys by probing the bark for loose pieces and then prying the loose bark back with a screwdriver. Look around the soil and roots of the tree for termite tunnels, known as mud tubes. Many termite species do not like to travel while exposed. They instead construct tunnels made of mud so that they can travel under cover. Purchase a termite barrier control treatment, such as Termidor. According to studies compiled by the University of Florida, Termidor is an effective barrier treatment to keep termites away from a home or a tree. Spray the insecticide over the bark of a pine tree near the exposed galleys and mud tubes using a spray applicator. Then pour the insecticide in a 2-foot ring around the pine tree’s base and allow it to soak into the soil. Pines have a taproot that grows downward, as opposed to a heart root or flat roots, so it is easier to keep termites from attacking the roots of pines compared to other trees by applying a barrier treatment. Termites typically only feed on trees that are already in declining health. You should consult an arborist to diagnose the reason for your pine tree's poor health and take steps to restore the pine's health so that the termites will not eventually return. Termites will not attack pressure-treated pine building material because it is pressure treated, not because it is pine. Do not assume that your tree is termite free because it is a pine.